Otherwise called "Duckunoo" or "tie leaf," blue drawers is a starchy type of boiled pudding. Some people make it with green bananas, but this delicious dessert recipe requires the JCS Fine Cornmeal. Mix all dry ingredients and grated coconut together. Add JCS Coconut Milk and JCS Vanilla, and mix well. 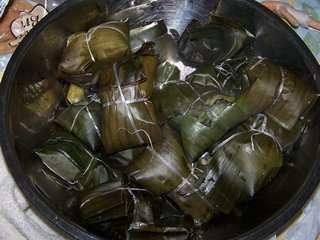 Place about 1/2 cup of mixture unto the banana leaf or foil. Fold up the sides to make a secure parcel.Tie with banana bark or string. Drop into boiling water. Have enough water in the pot to cover the parcel. Remove banana leaves/ Foil before eating.